If you are interested in how the winds of change are progressing at Microsoft, there is an interesting article MS Converter Project by Andy Updegrove that gives an overview of the 200 or so items that have been published since Microsoft announced an open source Open XML/ODF Open office converter project on July 6. The article includes an interesting prespective on why Microsoft took this route. I think the most interesting thing is that a decision like this is feasible within Microsoft, that there is a large enough pragmatic constituency within Microsoft pushing for a more open approach, as opposed to the traditional closed source way of looking at things. Recently I attended the 2nd National GIS Conference and Exhibition in Kuala Lumpur sponsored by MaCGDI (Malaysian Centre for Geospatial Data Infrastructure), where I gave a presentation on open source geospatial software. I think it is fair to say that the open source geospatial message is resonating among those who heard my presentations at MacGDI and previously at an Autodesk event at Pangkor Island. I found it significant that at this conference, which was attended by government, utilities, and a telco that the open source message was echoed by almost every speaker following my presentation, which was the first in the AM. However, Malaysia has been active in open source for a long time, so this is not as surprising at it may seem. Like most other emerging nations, Malaysia has been very positive on the open source movement. But Malaysia has been one of the real leaders in open source in Southeast Asia, probably because there is an active open source movement and the government has been very active in encouraging open source. For example, there is an open source competency centre Open Source Competency Centre sponsored by the government. There are some interesting web sites if you are interested in finding out more about open source in Malaysia including MYOSS mailing list, the Malaysian National Computer Confederation Open Source Special Interest Group (OSSIG) runs the OSSIG mailing list, and there is the mypenguin99 mailing list. Other sources of information about open source in Malaysia include MyOSS Magazine and Red Hat on Malaysia. One of the most interesting sites I have seen recently is Malaysia Singapore Maps. This site was developed and is maintained by a non-profit group of GPS mapping enthusiasts, who build and maintain accurate and updated GPS maps of Malaysia and Singapore, totally voluntarily. The maps are distributed free of charge for personal use. Last week I was in Kuala Lumpur attending the 2nd National GIS Conference and Exhibition and I had an opportunity to chat with several utility and telecommunications companies. It brought home how ubiquitous the infrastructure management workflow that I discussed in my first blog several months ago is. Everywhere in the world utilities and telcos manage infrastructure (outside plant) in basically the same way and are facing similar challenges. In places like Malaysia and Eastern Europe the problems seem less daunting than in North America and Western Europe because there are fewer legacy systems to be dealt with and modern technology can be applied. I remember a presentation at the last Oracle Open World in London by Lars Wahlstom, who pointed out that the telco industry hasn't even scratched the surface of using IT to reduce costs compared to the low cost airline industry (Ryan, TAM, Southwest, etc. ), the banking industry (ATMs), and the German automobile industry (where SAP got its start). A survey in the US showed that in 2004 50% of the labour force in the electrical utility industry in the US is over 45. I suspect that this applies to other utility sectors and to telcos in the US as well. I discovered in my recent visit to Malaysia this appears to be a problem there too. What this means is that a lot of knowledge about infrastructure is going to leave utility companies and telcos around the world in the next 5-10 years as older experienced workers retire. New workers will have to rely on the information in the corportate facilities database, unlike the older, experienced workers who rely on what's in their heads. There are essentially two processes, one for major projects and one for for small install and repair jobs. Major projects involve constructing infrastructure for a new residential estate or subdivision or for a major new commercial development. The Engineering department uses a CAD desktop application to create an electronic workprint. Based on this design estimates are prepared using a database of standard material and labour costs (referred to as compatible units in some utility sectors). The workprint gets converted into a paper construction drawing which is typically a large format paper plot that is provided to the construction subcontractor. If what is actually built differs from the design, the paper drawings may be marked up (often referred to as redlining) by the construction subcontractor and is returned to the Records or GIS Department in the form of an as-built. 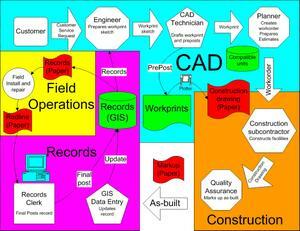 The newly constructed infrastructure is digitized from the paper as-built into the GIS by data entry staff. To give you some feel for the number of major projects that a utility or telecom manages, Telefonica, a large telephone company with about 16 million access lines, completes 1,300 major projects per month. For smaller jobs, for example, when you or I request a new telephone line or report low water pressure, a paper or microfiche record accompanies the workorder that is provided to the field person who comes to your house or business. For the same telephone company I mentioned previously, they complete 200,000 work orders per month. An electrical utility with about 4 million meters completes 30,000 work orders per month. The challenge for IT is how to help utilities and telcos make progress in solving these business problems. A helpful way to understand the workflow problem is to look at a schematic of the workflow process I outlined above. This suggests some obvious ways to streamline the infrastructure management workflow to help address these business problems. The most obvious thing that strikes you about the information flow is that all or parts of it are based on paper. Design information flows from Engineering to Records in the form of paper as-builts. Records data flows from Records to the field staff as paper maps. Asset information flows as paper from Engineering, Records, and the field staff to Finance who typically manage asset financial records. The result is redundant processes, such as data entry staff redigitizing as-builts, and backlogs. To give you a feel for how serious the as-built backlog problem is, these backlogs can extend to multiple years. The second problem, which I also heard reiterated in Malaysia, is that typically there is no information flowing back from the field to Records. This creates a serious problem because the field staff is the best source of information about facilities because they work with it everyday, they need uptodate, reliable data to be productive, yet they are rarely empowered to participate in maintaining the data. In the context of the aging workforce this problem exacerbates what is already a critical problem because there is no effective mechanism for transferring the knowledge in the heads of experienced workers to the facilities database. I think most IT people would agree that technology is no longer the excuse. IT can solve these business problems, but technology by itself cannot do the job. For example, Engineering, Records, Field Operations, and Finance are usually separate groups within the utility or telco and there is often little motivation or mechanisms for collaboration or cooperation. Even worse there are often work rules that prevent cooperation. From a technical perspective the critical components required to address the problems that I've outlined are a spatially-enabled relational database management system (RDBMS), CAD/GIS integration, a Web 2.0 environment to enable field force participation, and back-office integration, for example, spatially-enabled asset management. Whwn you are managing millions of objects (poles, manholes, conductors, service points, transformers, ...) that are constantly being updated and to which many different groups in the organization require access, a spatially-enabled RDBMS, such as Oracle Locator/Spatial or PostGIS/PostgeSQL, is essential for managing these data concurrently. For example Telefonica's Oracle database contains about 100 million objects. Spatially-enabled RDBMSs enable open access to spatial facilities data across the organization because all data is accessible through SQL and ODBC, JDBC, or OLEDB. Most utility and telco infrastructure data is comprised of basic geographic objects: points, polylines, and closed polygons. Many RDBMS and Geospatial vendors support the OGC's Simple Feature Specification for SQL (SFS). which enables spatial facilities data stored in an RDMS to be shared among multi-vendor applications. For example, at the last GITA conference the City of Tacoma and the City of San Jose described deployed systems that supported sharing common spatial information among Smallworld, Autodesk, ESRI, MapInfo Bentley, and Intergraph. Recently the OGC has been working to extend the SFS to include cartographic text, so that annotations will also be shareable in the near future. The key problem that CAD/GIS integration solves is the as-built problem, that is, avoiding redigitizing facilities data already captured by Engineering during the design process. 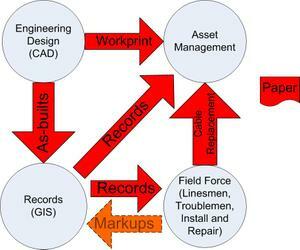 For example, Autodesk Map3D can connect directly to Oracle Locator/Spatial, ArcSDE, and other spatial datastores, making it possible for Engineering to capture their workprints directly into the Records GIS database, eliminating the need for the GIS data entry staff to redigitize this data from paper as-builts. A related key enabling technology is long transactions. Long transactions, also referred to as data versioning, which enables infrastructure date associated with a major projects to be safely stored and managed in the same database as the facilities production data during the process of design and construction. As an example of the benefits of CAD/GIS integration, Telekom Serbia built their integrated Telephone Information System (TIS) on Oracle Locator and Autodesk Map and was able to reduce the time to provision a telephone from forty to two days. Empowering the field force to participate in maintaining the central facilities record database makes it possible to achieve three important goals; improve data quality, raise the productivity of field staff, and make it possible to employ younger, inexperienced field staff. For example, several years ago ENMAX Power Corp. guaranteed their field staff 24 hour turnaround for all updates from the field. This was a low tech solution, in which Records staff were instructed to give updates from the field highest priority. A recent audit by an external auditor, in which a field survey sampled a subset of ENMAX's database and compared it to what was actually in the field, reported 99.6% reliability for ENMAX's outside plant database. For an industry for which 70-80% is typical, this is a significant achievement. Technical advances in the last year or two have made mobile solutions for field force automation feasible. Wireless technology, either WiFi, 2.5G, or 3G, have become ubiquitious. In addition handlheld computers with a range of form factors from pocketable to carry-along with as much computing power as a notebook computer are rapidly coming on the market. Enabling a trained field person to use productivity applications running on handhelds with a direct link to a central spatially-enabled RDBMS empowers him or her to actively participate in maintaining facilities data. Instead of the traditional two-step redlining process, updates can be made directly by the field staff into a version, which can be quickly reviewed and committed by Records staff. This process dramatically improves the productivity of both field and record staff, while protecting the production database. I see Web 2.0 as the key enabling technology, because it enables remote field staff to participate directly in the maintenance of spatial facilities data. The result will be greater productivity and improved data quality, which will make it more feasible for utilities and telcos to employ younger and less experienced field staff to replace more experienced staff as they retire. Back-office integration has been a key objective of many utilities and telcos over the past ten years or more. But a relatively new example of integration is spatially-enabled asset management, which links locational facilities data created by Engineering and managed in a geospatial datastore with asset financial data. This link helps address operational as well as strategic business problems. From an operational perspective it makes it possible for field staff when they replace a cable or a transformer to update the asset database at the same time as the Records database, instead of a time consuming two step paper bound process. Linking locational facilities data and asset financial daya is often relatively simple to implement. For example, ENMAX Power Corp was able to link their spatial facilities data stored in Oracle Locator to their asset data, which was also stored in Oracle, using a simple foreign key relationship. Taxation - Utilities and telecoms are taxed based on assets in the field. Valuing assets - For example, as required by GASB legislation in the US. Capital asset rate base - Utilities and telecoms have to declare to regulators their deployed assets to justify rate adjustments. Investment analysis - Optimize investment strategy using geographical analysis. As a fascinating example of what you can do by linking locational facilities data to an asset management system, I'm including a thematic map prepared by Boris Damjanovic of OSA in Belgrade showing the type of map that can be created using spatially-enabled asset management. 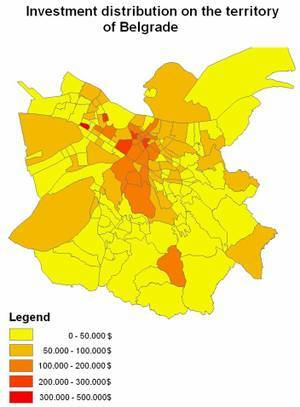 This simulated map shows the investment in telecom infrastructure in different districts of Belgrade. The most important thing about this map is that the legend is in dollars ($). To me spatially-enabled asset management makes geospatial facilities data interesting not only to the CIO, but also to the CFO. Autodesk has launched a new web site (Autodesk Labs ) that provides early access to new prototypes, experiments, applications and technologies. These technologies are created by development folks at Autodesk, and will include everything from drivers to plug-ins to brand new applications. Autodesk Labs was built as a creative outlet for developers who wanted to host their out-of-the-box ideas in an environment where users can access them freely and provide feedback directly back to the developer. Right now you can find some interesting projects that you might want to try. If you want to view a DWF file without installing viewer software on a PC, Mac, PDA, or cell phone; on Linux or Windows; or Firefox or IE, take a look at this.